The issue surrounding the attraction of sharks by the provisioning of food (baiting) is certainly relevant to the current growth and interest in the shark viewing industry. The South African Shark Viewing Industry has experienced phenomenal growth and a recent socio economic study of eight White Shark Cage Diving operators at Gansbaai indicated that they generated approximately R 30 million in direct ticket sales over a twelve month period and took approximately 30 000 tourists to sea. The down stream benefits that flowed from these direct ticket sales were calculated to be in the region of R 283 million to South Africa. The White Shark Cage Diving industry is premised on provisioning (baiting) and this has not only resulted in the positive outcome of legislative protection for white sharks in South African waters but has also set South Africa up as the White Shark Viewing capital of the world. None of this would have been possible without provisioning. The age old debate surrounding the baiting of sharks is perceived by some members of the public as the throwing of pigs heads and copious amounts of cows blood into the water to lure notorious man eating sharks to boats and after having acquired a taste for mammalian blood the sharks inevitably head to the nearest bathing beach to devour all water users. 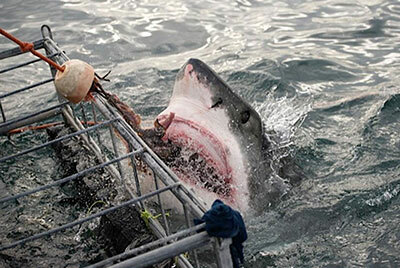 In the White Shark Cage Diving example the government guidelines set down the maximum fish bait that any operator is allowed to use on any given day (25kg) and the feeding of sharks is kept to a minimum. The reality is of course that over 100 million sharks are killed each year and thus the government has rather understandably adopted an approach that would rather see fat sharks than no sharks! That said, let us move our discussion to the baited Tiger Shark diving on Aliwal Shoal and on Protea Banks which has an incredibly low baiting footprint. In the Shark Park Experience 100ml of anchovy oil and five kilograms of chopped up sardine are used to attract a diverse range of sharks for clients and scientists to view and study. On an average day almost 30 sharks are drawn to this operation and by way of calculation this amounts to 100 grams of fish per shark per day! Given that these sharks would require consumption in the region of 10% of their body weight per week the average size shark, that we see, would need about one kilogram of fish per day for there to be any negative impact on the shark’s behaviour according to South Africa’s top shark scientists. It bears mentioning that baited Tiger Shark operators have instituted various checks and balances to determine the level of impact on the sharks by sponsoring research into exactly these issues and the potential impacts on other user groups. All of these continuing studies have given this operation a clean bill of health with nothing but benefits to the sharks, shark viewers and surrounding business communities. 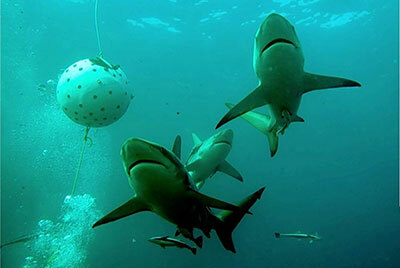 In fact the surfer user group sponsored the first acoustic tags, which were attached to the tiger sharks and used to study their movements of in the Aliwal Shoal MPA. As a result of the effort to view sharks in the Aliwal Shoal Marine Protected Area it was possible to get five species of shark protected in the Aliwal Shoal MPA regulations. 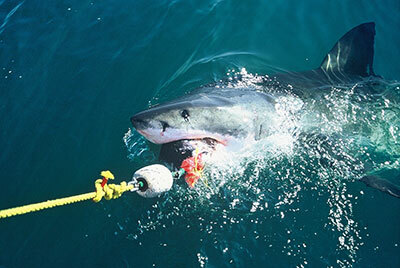 The benefit of greater governmental awareness of the plight of sharks both locally and internationally, as well as the benefits of provisioning operations (operating under permits issued by the Department of Environmental Affairs and Tourism) to the South African tourist portfolio of offerings has seen the baiting debate move beyond the antiquated “blood and guts” position put forward earlier. If provisioning is done responsibly, and we do believe that we are a responsible operator, then the plight of sharks can be highlighted and our education through experience ethic can hopefully eradicate the negative perceptions of sharks in people’s psyche and raise their conservation profile. Participants in our shark-viewing programme quickly dispel the irrational fear of sharks once they have spent only a few minutes with these magnificent creatures. Some of the greatest skeptics, before their experience with us, have turned out to be some of the most motivated individuals in the fight to help conserve sharks. South Africa has something truly special to offer the world. The limited impact of the provisioning versus the significant scientific and educational opportunities which the experience provides have been accepted by the government and people the world over as well worth it. 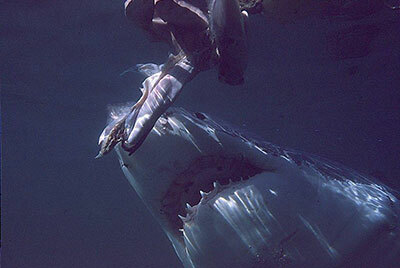 It bears mentioning that in the time it has taken to read this, more than 1000 sharks would have been killed.